Residents living near Falcon Road might be interested in the current consultation the council has received for the Woburn House site on Falcon Road. The site was the old job centre and is currently a solicitors. 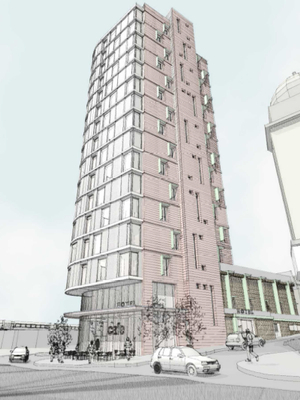 The application is for a 16 storey, 132 bedroom, hotel. I know many who objected to the Clapham Junction application will have similar reservations about this scheme, but also know many who feel that the area desperately needs some hotel provision. If you wish to see more details, you find them on the council website’s planning section. The application reference is 2009/1291. If you wish to make a representation, in support or opposing the application, you can do so by emailing planningapplications@wandsworth.gov.uk or on the council’s website. It is worth noting that your comment will be publicly available – so you might want to send your comment as an attachment if you do not want your email address publicised. As with the Clapham Junction application I do not wish this to be seen as pre-determining my views in any way, this post is merely to provide information.